In 1758, Rousseau announced that he had adopted "vitam impendere vero" (dedicate life to truth) as a personal pledge. Despite the dramatic nature of this declaration, no scholar has yet approached Rousseau’s work through the lens of truth or truthseeking. What did it mean for Rousseau to lead a life dedicated to truth? This book presents Rousseau’s normative account of truthseeking, his account of what human beings must do if they hope to discover the truths essential to human happiness. Rousseau’s writings constitute a practical guide to these truths; they describe how he arrived at them and how others might as well. 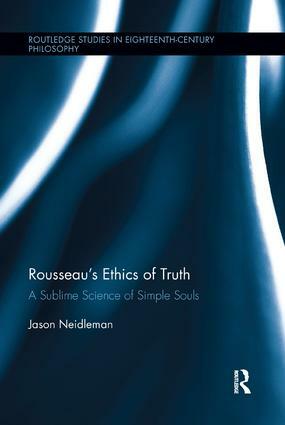 In reading Rousseau through the lens of truth, Neidleman traverses the entirety of Rousseau's corpus, and, in the process, reveals a series of symmetries among the disparate themes treated in those texts. The first section of the book lays out Rousseau’s general philosophy of truth and truthseeking. The second section follows Rousseau down four distinct pathways to truth: reverie, republicanism, religion, and reason. With a strong grounding in both the Anglophone and Francophone scholarship on Rousseau, this book will appeal to scholars across a broad range of disciplines.